Hello, and welcome to my thread! I hope you will enjoy reading though this commander suggestion, and I will try to explain it the best I can in both the main post, and the discussion section bellow. The commander I am going to be suggesting is going to involve improving the stats of friendly units, while degrading the stats of the enemy's. Destabilize the enemy's will to fight though weapons of terror, and propaganda, while officers support and inspire your troops to fight harder. Dispatch elite Knight's Cross recipients and a fearsome Tiger Tank to break the enemy's morale. Finish them off by utilizing the superior firepower of the Schwerer Gustav to destroy all who oppose you. Zeal provides different benefits depending on the amount of squad members an infantry squad has. The lower the number, the stronger the buff. Doesn't apply to team weapons, snipers, or the Sturm Officer. - Model health is 82 instead of 80 to avoid RNG explosive deaths. Before I go over the changes, I will tell you a small bit about railway artillery if you've never seen it, or used it. 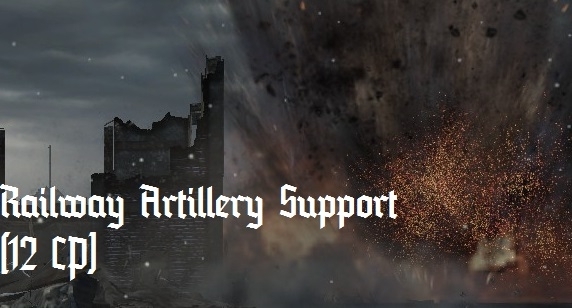 Railway artillery is a 12 CP ability found in both the festung armor doctrine, and the osttruppen doctrine. The ability costs 200 munitions currently, and it fires 3 inaccurate (except for the first one) shells at the targeted location. The railway artillery is confirmed (in audio quotes) to be fired from the Schwerer Gustav. The Schwerer Gustav fires 80 cm shells that have made craters deeper than 100 feet! -No longer fires 3 shells, but instead 1 shell. -Munition cost will increase from 200 to 240. -Maximum damage increased from 600 to 2200. -Ability recharge time increased to 300 seconds. -Cannot be targeted in enemy base sector. -Blast radius is now slightly larger than the original radius (12 instead of 9). -Infantry on the most outer area of the blast radius will be temperately suppressed. -Crater provides heavy cover (similar to satchel charges) instead of light cover. Knight's Cross Holders move 3% faster, and are 2% harder to hit. 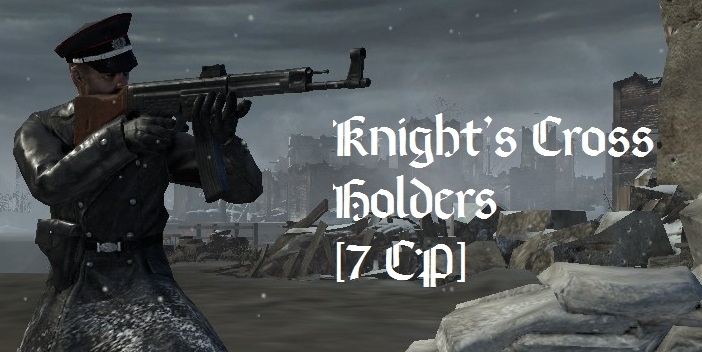 The Assault Grenadier's and Knight's Cross Holder's Model 24 Stielhand Grenade Assault costs 5% less. Knight's Cross Holders earn veterancy 5% faster. 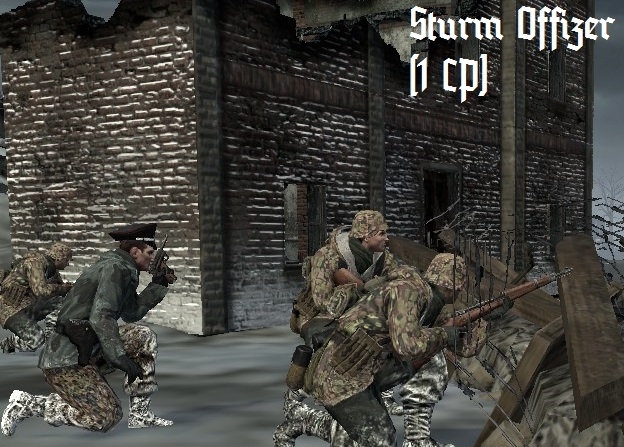 Overall my intention of this commander is to give the Wehrmacht Ostheer some more flavor and firepower. This commander is never necessary similar to how most commanders aren't (except if you're playing as soviets), but in my opinion, it would be a good addition to the commander roster for the next patch. I picked the abilities so that they would go along with the actual role of the commander (superior firepower and, of coarse, terror), which would, in-turn, avoid the same fate as the blitzkrieg doctrine (Which should really get different abilities). Thank you for reading this thread, and I hope you enjoyed reading it. Thanks for taking some time to look through my idea. Sounds cool but IMO zeal is under powered and overpriced. It is very odd for an ability to not have any benefits for full-health units. I also think it come around 5CP. It's very odd for a elite inf squad to come at 7CP. They sound like they would just be constantly gibed by tank rounds given the squad size and timing. I would suggest 3-4CP. Also 90MP is an absurd reinforce cost. The formula for reinforce cost is the unit's price divided by two divided by the number of squad members. So basically it should be 70MP. Though IMO at most it should be at most 60MP. Another problem is that a 3-man squad of exterminators similar to obersoldaten would be that it would compete with the OST sniper in terms of usage. You have to make sure that they have a role besides just killing infantry and that there is actually a reason to risk them in front line combat (which one usually avoids with snipers/obersaldaten). Lastly for the Knights Cross holders I would recommend giving them over 80 health (like in CoH1) or increasing there squad size. 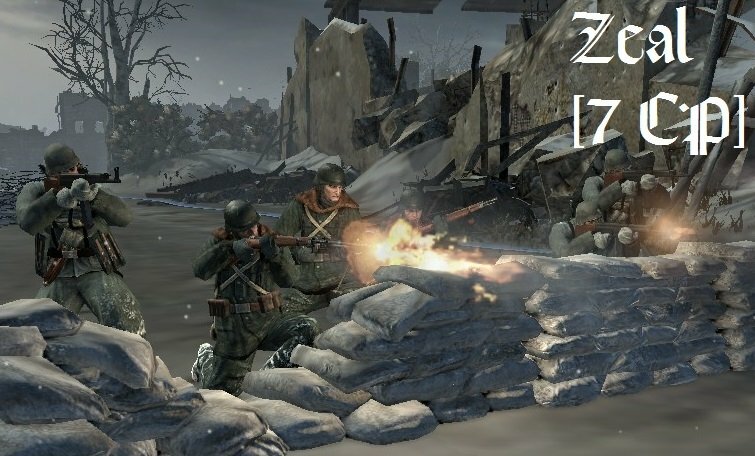 This way they wouldn't be ultra vunerable to snipers (as it would only take 3 shots if each model has 80 health), explosions and also they wouldn't just disappear while in front-line combat. I really like the concept of the commander and I really think it fits a role that no other OST commander fits. Good job. It's very odd for a elite inf squad to come at 7CP. They sound like they would just be constantly gibed by tank rounds given the squad size. I would suggest 3-4CP. Also 90MP is an absurd reinforce cost. The formula for reinforce cost is the unit's price divided by two divided by the number of squad members. So basically it should be 70MP. Though IMO at most it should be at most 60MP. First of all, thanks for the feedback. I really do appreciate that people actually look through this stuff. -Where the KCH (Knights Cross Holders) really shine is in their damage output. If you treat them like a sniper, then they'll continue to accumulate veterancy. Once they get to vet 3 they're able to take on all infantry in their path, even MGs! I try to keep them for the later game just to make them to not be too overpowered during an infantry-heavy phase. It also encourages combined arms with KCH due to their obvious weakness vs armor of any kind. Once again, I'd like to thank you for your feedback, and I hope you have a good day/night! I like it a lot. Only issue to me is Gustav damage. It seems huge to me but if someone could post Sturmtiger and Goliath damage so I could compare. Golaith is 200. 400 if it is destroyed by explosion/enemy fire. It also does 1000 damage against emplacements. Don't worry, I took that into consideration. The Gustav damage isn't enough to kill braced emplacements. Everything else... they would probably be wiped by a sturmtiger/stuka dive bomb in a similar fashion anyways. Just to make sure that only idiots let mobile units die to this, I'll consider a longer firing time delay. I'm pretty sure that all explosives have a 1.25x multiplier vs buildings also, but I'm not exactly sure which explosives that applies to. Either way, I took that into consideration also with the damage of railway artillery. Actually I think British emplacements take reduced damage from arty. Though I'd have to look at the target tables again to be sure. all the another things are Excellent. Not a huge fan of Knight's cross holders. Come on, this isn't dawn of war, we shouldn't have "nazi terminators" running around. I find it kind of dumb to have squads of "super soldiers" in a ww2 game (shock troopers aside).